Every citizen of the western world has been under pressure to become a consumer. You may have a job, so you may feel productive, but at home it is most appreciated if you just go to the supermarket and shopping mall, load you house with consumer goods, yourself with a mortgage and other debt, so you are a predictable part in the grander economic scheme. This scheme wants to maximize the utilization of fossil fuels, and that is all it wants. It may be a genetic thing that people do like to create value on their own. This is fine as long as it doesn’t lead to a drop in consumption, so you can make a few bookshelves, but they won’t look as good as Ikea stuff, you may make jam at home, but it will have to be regulated. Every activity that makes people less dependent is fought by businesses that earn their living of this dependency, and the biggest business is the fossil fuel business. Enter the concept of basic income. The European social system meant that if you lost your job it would be better to give you money to maintain a certain standard of living than to let you become destitute and unfit for any work. This was affordable after WO II due to the abundant fossil fuel resources. Recently this social system has come under pressure, exactly because fossil resources have come under pressure. Now that there’s Arctic oil and other alternatives to revive the fossil fuel streams one could imagine that the social thought revives as well, after all, any cashflow is good for banks and the fossil fuel sector, whether it is ‘earned’ or not. Basic income also answers the question “If you build a machine that does the work of everyone,is everyone jobless with no money to buy what the machine produces? Or do they share in what’s being produced for free?” This is the basic question that was never asked during the industrialization of the last century, which is about to go in to hyperdrive with 3D printing and other new technology. The basic question of automated production is whether whatever makes the machine work should thus be given away in the form of what is produced. If the machine uses oil and produces shoes, what price should the shoes be if nobody can earn money to pay this price (because of automation). Can the oil be given away? Of course we have seen a century in which oil has been given away in ever increasing quantities, that is why people where so prosperous and labour was so light, credit so cheap. Do you see how it was given away? Can you make oil? A basic income to buy goods made by machines consuming fossil fuels (directly or indirectly), or at least products resulting from a largly automated production cycle, makes sense. It would make the most sense if the energy used came from renewable sources. This is the Roboeconomic concept, robots do most of the work, the ecology is restored because renewable energy is used, and nobody has to sweat for their basic needs. Society will focus on cultural differentiation, style and quality. That is the scenario with renewables, energy sources that have many first owners in a society that cut out intermediaries (the tax office creates credit based on renewable energy capacity and gives it to the energy source owners). To do the same with fossil fuels the economy would look a lot like the one we have today, only be even more like a monoculture. Obviously fossil fuels are scarce and efficiency is a constant focus of attention (not the case with renewables, they are abundant). This means we need to all have the same culture, wear the same clothes and shoes, at least if we want to live of a basic income, a stipend from Shell, Exxon, BP etc. probably wrapped in a moral argument for the good of everyone. The problem is that this could be pushed by the fossil fuel lobby, just to secure their dominance and to turn the semiconsumer or even a prosumer back into an ultraconsumer, a truely dependent person that fully depends on fossil fuels to live, hence without any political will or ability to cut the dependency. Renewables would free people of such a dependency because they make it possible to produce what is needed without having to ask anybody. And if fossil fuel interest would push for a basic income they would surely prevent their ultraconsumers to own renewable energy sources. The do that now, but then they would have enough power to push through a law that says : If you produce energy, it is deducted from your income. We already live in this society, in which a large portion of the population create very little or nothing that other people need. But it would be a devious thing if fossil fuel interests started to push for a basic income. It would be even harder to get rid of them. With a basic income in place they could push ahead with automation (as they have to increase efficiency to prolong their dominance) turning more people into hyperconsumers. Neutralizing the ‘downside’ of poverty in a move to cause more people to become poor. This would be a downwards spiral because fossil resources deplete. On the way down people would have to be ‘shedded’ from the system. Maybe suspecting this strategy seems illogical, but if it did come about it would mean another generation would mis the true abundance and colorfull society enabled by a basic income from renewable energy, which has a wealth capacity of several thousand times the one afforded by fossil fuels. So beware, don’t let ‘fossil fuel socialism’ lock you in a hopeless ultraconsumer role..
What data is being gathered about you? The below companies will have to be summoned to delete their databases. Companies involved Acxiom, Corelogic, Datalogix, eBureau, ID Analytics, Intelius, PeekYou, Rapleaf, and Recorded Future. The author of this has originated the term ‘Extraeconomics‘ to denote a supplement to fossil fuel credit based economics, so as to repair the balance between depletion and replenishment of natural resources on Earth. As the author is not indoctrinated in the full breath of economic thought it is unlikely Extraeconomic will gain much traction. To increase understanding of it’s ideas a comparison with other alternatives suggested to economics may raise its profile. A thing necessary for succesfully combating global warming. He starts from the economic concept of ‘growth’ which he equates to an increase in material goods “Let us propose that these possessions grew by 4.5% a year.”. This is a misunderstanding of economics, it is not about the increase in posessions, it is about the increase in GDP. If it where about the growth of the amount posessed this would get out of hand. Monbiot argues that a success of economics would mean ultimate collapse for lack of sustainability.. The below proves he read this blog, or that he can think.. The destruction caused by fossil fuel exploration and consumption is appaling. The economic mechanism Monbiot however is not understood, not by the government of Equador, which asked money to NOT dril for oil in its forrests. We know that in the carboncredit economy money derives its value from its ability to secure fossil fuels, so money equals fossil fuels. Asking money to not dril for fossil fuels is asking fossil fuels to not dril for fossil fuels. Nobody is going to answer that request. Monbiot continues with a more important aspect of economics, that it always exploits, and will always continue to find resources to exploit. This is because the process of exploitation consumes fossil fuels and those selling fossil fuels like the revenue (with which they can buy part of whatever is exploited). Gold mining is a prime example. A lot of the gold goes directly to those supplying the diesel to mine. Growth is the expansion of the use of diesel, oil, coal etc. causing increased revenuw streams (requiring the creation and destruction of money so prices don’t hint at the availability of resources). Monbiot repeats that the rate of this ‘growth’ is unsustainable, even if the force behind it kills us..
Monbiot then goes on to lament our distraction, that we can’t even discuss this consumptive madness. Its a passionate plea, but he offers no alternatives. The biggest weakness introduced in thinking about the economy is that money is something separate from resources. They are temporary symbols for those resources, or they are supposed to be. The banking system however teaches us money can ‘buy’ anything any time and does not tell us how much money there is, how much can be created or destroyed at any time. The result is that people watch money thinking they are watching reality, and this is the biggest destration hiding the destruction described by Monbiot. An even bigger weakness which extraeconomics solves is that there is only the market. This is the dream of economics. All things that exist come to the market, so any desires that could possibly exist can be met by applying money. This reality is the big prize for bankers. If you have money, you can do and access anything. It implies that everything belongs to the market, which is not true. The market is an abstraciton, so if we consider the owners of the market, they are people juse like you and me, and they surely not own everything. They usually control money, and use it to distract us long enough to let go of what we owned..
Extraeconomics solves the problem by doing two things 1. create resources 2. not bring them to the market. An extraeconomic territory creates forrest, carbon fuels, fish stocks, without offering it for sale. It does so using renewable energy, unpatented technology, without being tied into international law. Extraeconomics rules areas that might as well be on Mars. Economics does not work in these areas, and because it does not work whatever can be produced can compensate the exploitation of its fossil fuel driven machine. 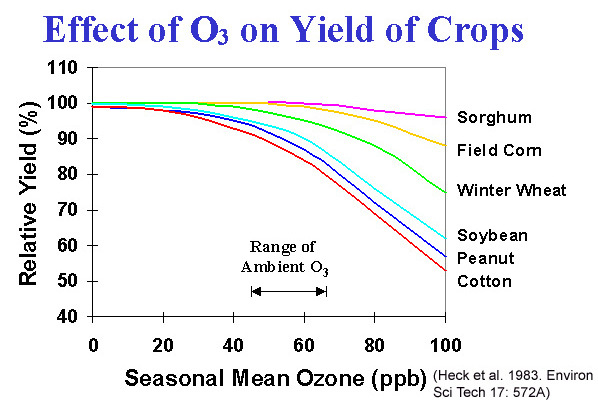 Extraeconomic zones can reduce CO2 by growing organic materials for that sole puspose, as well as sustaining the people involved. As long as the materials are not economically exploited, the capture of CO2 remains effective. Just like one can opt out of a religion, one should be able to opt out of economics. The first step is to use renewables productively. Examples are organic farming or manufacturing using wind energy. The extraeconomic aspect shows up because a person living on an organic farm, being able to pay taxes in produce, doesn’t need any money. he/she is outside the reach of the banks, and thus of the economic exploitation machine. Of course more is needed to stop the lawnmower that is going to raize to the ground every place on earth fueled by gas, petro, oil, diesel, coal..But understanding the distraction money is, and that not offering goods to the market, but distributing them locally will slow the lawnmower down, is a first step. 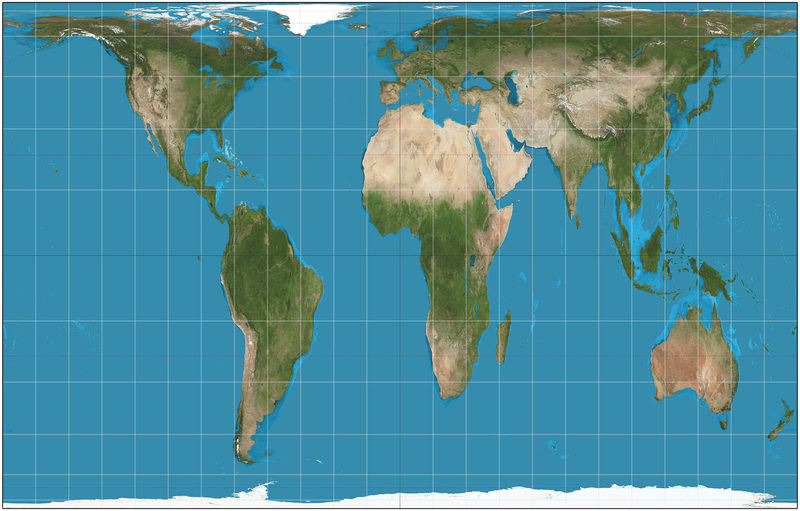 The above map looks different from the maps we know, it’s a Gall–Peters projection, instead of the usual Mercator Projection. Instead It shows the true surface area and has different lines cutting it up (they don’t converge at the poles). . It shows an interesting aspect of Europe, not matched by China or the US, and that is the enormous area of barely inhabited desert land in North Africa. The insolation (solar energy) in the region is enormous. A fraction of it populated by solar power plants could power the world. 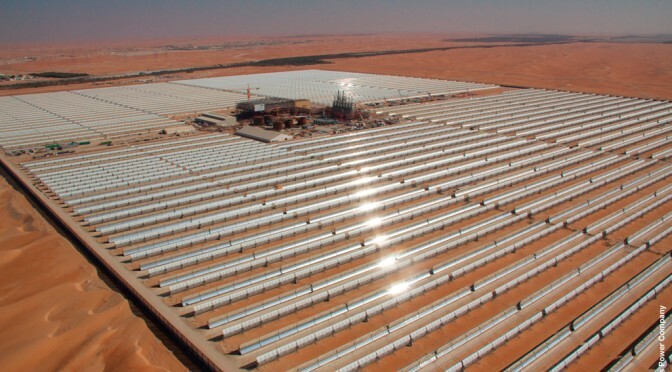 Several of the North African countries are making strides in adopting renewable energy, solar, for instance Morocco, where CSP (concentrated solar power) plants are up and running, and an Ivanpah type Ouarzazate 160 MW CSP project has just started. The country is also investing in wind energy. Morocco also invests in wind farms and attempts are made to partner up by german CSP companies. 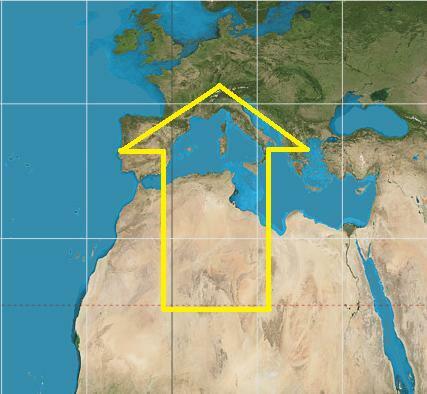 The cooperative exploitation of solar and wind resources in North Africa seems a much better idea than the IMF/WB/Wallstreet led ‘Arab springs’, crisi and series of painfull revolutions around the mediterranian to extract assets, oil, gas and reduce consumption. See Pierre Jovanovics interview about Blythe Masters. The Desertec initiative (an industrial cooperation whit the goal of getting solar electricity from North Africe) has had many critics, like Herman Scheer, who like us saw through it’s delaying tactics. A nice interactive map of what has been achieved can be found here (as shown above). We’d propose the blang zone at the bottom of the above map as Extraeconomical territoriy, protected by all of the above, for massive CCS, which done right means carbon fuel production (not CO2 storage, that is lame and unstabile). The people in the regions can be employed, fed and kept on a high standard of living. We know resources that are yet untapped to make the process of building the installations much cheaper and feasible, even if it seems like an enormous task., but the object of ‘mining’ the EurAfrican Power Block for renewables, yielding more than 100% the energy we gain today by polluting our land, air and water by burning fossil fuels, seems to be a focus that can bring peace, health, wealth and a stabilizing force for our ecosystem and perhaps the world. Fine particle dust is hard to filter from air, because filters with a mesh size of a few microns don’t let enough air through to be practical, unless you invest a lot of energy to push it through. Now researchers in Hong Kong have developed a new type of nano filter that does allow a person to breath through it, but also catches the smallest (and most dangerous) praticles. Fine particles are dangerous because instead of getting stuck in the lungs, they enter the blood stream and circulate around the body, accumulating in the heart and brain. Diesel fumes have for this reason been associated with higher heart failure risk. In mice it was shown that early exposure to diesel fumes can cause problems later in life, whereas people raised in clean air have less problems. A face mask air filter that can prevent exposure to these particles is a great step, and no doubt welcome in heavily polluted China. The filters can also be used to neutralize NOx and other emissions, probably by combining them with carbon filters or neutralizing chemicals. This can be a great benefit for urban areas where it can help remove smog where it is concentrated, for instance at the exit of tunnels. A very effective way to remove fine particles is the electrostatic precipitator. It charges fine particles and then applies an electric field to separate them from the airflow. This however requires quite a lot of energy. Combining the electrostatic effect with water mist (to capture particles) has shown to be very effective (link follows), but this is water hungry. A method that only needs forced ventilaton seems to be superior, especially when it can be powered with renewable energy. An interesting aspect is that a filter that catches micron scale particles can also desalinate water. The pores of a Reverse Osmosis filter lie in the range of 0.1 to 5,000 nm (4×10−9 to 2×10−4 in), so the minimum is 100 microns (or micrometer). There’s a difference between water and air of course, but maybe the same technology can bring us large surface low pressure and lower cost RO desalination. If intensive farming is stopped the soil is dead and polluted. Zones that need to transition due to fossil fuel supply collapse can’t expect to be fertile for a couple of years. This means such collapse would bring widespread famine and starvation. These ideas are part of the extra/robo-economic view of the future. Renewable energy source manufacturing has reached a high level of repeatability. Wind turbines and solar panels and solar thermal vacuum tubes have been manufactured in massive quantities, Even if innovation still adds gradual improvements, we have many working solutions, from hydro turbines to peltier elemens, you name it. The collection of manufacturing methods for renewable energy sources is still in its first generation in our view. The second generation is different from the first not in yield or efficiency but in cost. It is not cheaper, it is costless. This costless production is achieved in a simple way : By using renewables. Right now buying a vacuum laminating machine to make a solar panel requires an initial investment, and then as you use it it will use energy from the grid, kWhs made by Chinese coal fired power plants. This has several effects. One of them is that making a solar panel pollutes. Another is that selling a panel ultimately needs to yield the cost of the coal that made the electricity. 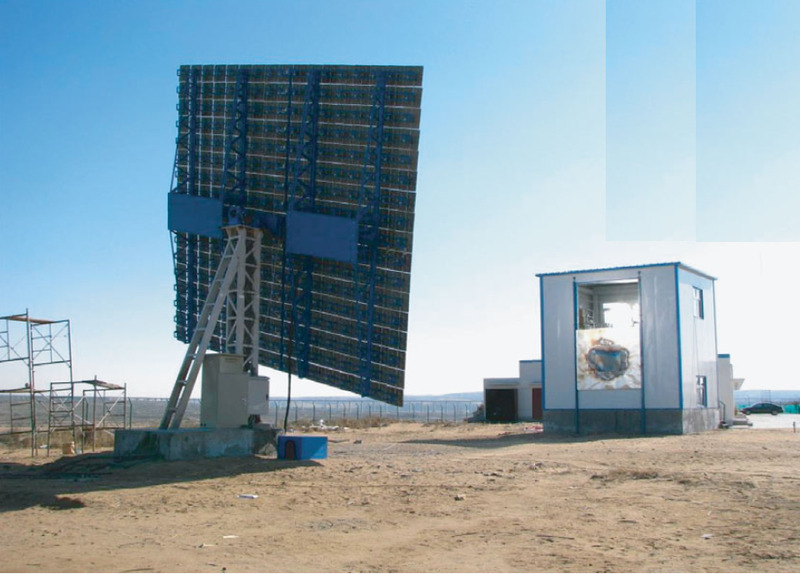 Another is that the chinese economy needs to enjoy the use of the panels, after all it spend the coal. As the global economy desintegrates due to shortages of fossil fuels, these factors will start to count move heavily. The energy to make solar panels and other renewable energy sources could come from renewables themselves. The logistics chain (which preferably is as short as possible) could be powered by carbon free fuels like NH3 that where generated along the route using wind energy, or electric trucks, or trucks running on synthetic methane. Every time a solar panel factory adds another solar panel to deliver electricity to its production and distribution chain, it reduces its cost and becomes more ‘competitive’. Ultimately the factory can set a price that allows its workers to consume and be motivated, yet still dominate the market. A wind turbine manufacturer can do the same. It can build its plant in a windy region, put up turbines to power the plant, change the heavy transport trucks (which can carry batteries no doubt) to electric. Make the glass fiber, refine the aluminium, etc. etc. Already Iceland is refining aluminium using Geothermal energy. It is an electrolytic process, but one assumes it could be done with solar in the desert as well. Because economics (the marketing of fossil fuel) and its ‘carbon credit’ now determine where energy is available for production, and because it needs to keep the energy dependency to continue to sell coal, oil, gas and derivative kWhs, manufacturing is captive in a ROI cycle that even requires it to destoy itself if the economic yield (return payed to banks) drops to zero. All processes in the economy are held as dependent on immediate fossil fuel input as possible. This maximizes the influence of banks and financial markets which in turn allows banks and financial markets to keep their business going. It is a limit to the expansion of renewable energy and our response to climate change. Renault factory plans to use solar, which will cut the cost of its cars. So the next generation of renewable energy source factories will be close to the place the energy sources are used, run on renewables, produce very low cost energy sources and be able to expand and act independently of the international banking system. This is why we don’t see much examples yet, why the above method of making solar grade silicon was burried, and why we need to push for it. A CIGS solar panel factory powers itself with CIGS panels! One way would be for companies like Vestas to open up investment in their plants for conversion to processes to ones based on renewable energy. For that one could create a fund or organization that also markets the idea of the ‘next generation’, This can also prevent factories to start with fossil fuel debt (credit). If we succeed to kindle the next generation renewable energy source factories (a mouthfull) we will never have to worry about the cost or the rate of expansion of the industry again.. So what is short term? One winter? Three winters? This declaration of incapacity may make us forget we do have to move to make ourselves independent. As soon as possible. And there are several ways to do it. Time and time again we have to realize our perception of what can and what can not be done is not reliable if we look at the market. The market is economic, meaning it has to depend on fossil fuels. Solutions that escape that dependency have not been allowed, sometimes in elaborate multi decade moves. Live without russian gas? Of course it is possible. 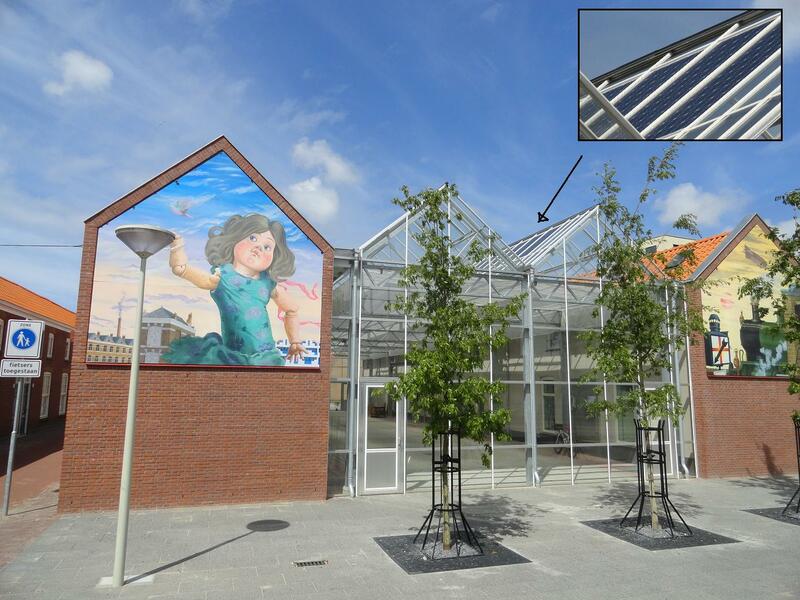 For Holland, first step is to give up the greenhouse industry. It’s nice, but it burns Gas for heating and CO2, which is a real waste of gas. First the easy ones : Let’s pipe H2 instead of Gas. Let’s make that H2 using solar cathalyst, for instance with cobalt. Japan did it, but the facts of that successfull test have been carefully hidden. Below an illustration of the project. Another option is to stop cooking with Gas altogether, converting most furnaces to induction, or mircowave, which would be more efficient as well. Another one is Heat storage : You can store heat in shallow heat sinks, insulated with vacuum insulation panels, for instance under the streets. They can accumulate heat during the summer, release it during the winter. Phase change materials can help increase capacity. Many heat storage experiments where cut short to show their yield, or hampered by laws limiting the temperatures allowed in underground storage. Legal objections with no practical risk can be overcome once the target of losing gas is chosen. Deep ground heat storage heat pumps are similarly cut in their performance because of rules about the allowed water temperature, turning many of them in electric heating systems. Then insulation or the house shell/mantle. The most optimal type may be vacuum insulation, easy to implement. Insulation saves so much gas it usually pays for itself in a couple of years. The level of insulation however is seldomly optimized. Not to zero heating requirements. 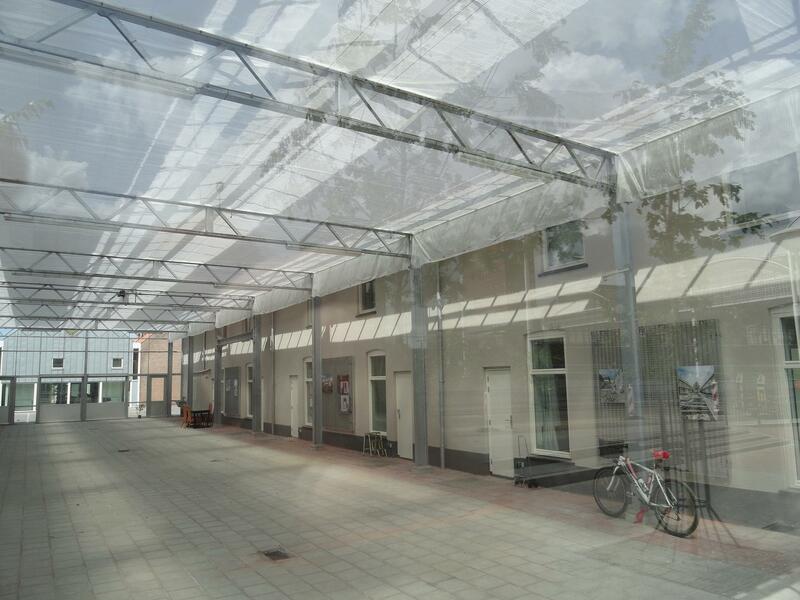 An experiment with a glass roof between rows of houses. Internally it is easy to see this does not obstruct traffic or other activities, even if the span is 12-15 meter. For more pictures see here (dutch). Wind energy can be used to generate heat, also in a utility scale. This heat can then be distributed just like municipal heat, wind heat generators can be part of the municipal heat system. Alternatively people can ‘load up’ heat storage units and take them home. This is a more time consuming system for sure, but it requires les gas, in fact,none at all. Power to Gas may seem to be in its infancy, but it’s a technology almost a century old. It means water splitting, CO2 splitting and the use of an iron catalyst. Vacuum solar collectors we now know are tubular ones, with relatively little surface per m2 compared to plates, but with higher performance due to the vacuum. Plate colletors that are vacuum are made by SRB energy and can make up to 400 Celsius steam from normal insolation. This is a huge difference because the higher the steam temperature, the more energy can be extracted. It can heat the home, drive a turbine, put into higher temperature storage. Cooperation with sunny European Nations Spain and Italy can become major heat exporters, they have dry zones that are sparcely populated that can start a solar farming like the farm fruits and vegetables now. Plants are 5% solar efficient, PV is 15% so there’s much to gain for these countries. A electric cable linking Morocco with Spain is already there. The European grid however is probably much less efficient than power to gas, even if that process is not very efficient. It has the added advantage that the gas can be stored for long periods. There’s also a gas infrastructure. The effort needs to be mandatory, not market driven, because the market is fossil fuel dependent, as is the financial sector. This is about a new foundation to wealth, one with several thousand of times more potential and an eternal lifespan. The sooner we work those that don’t want it out of the political system, the sooner we can reap the fruits of the sun, wind etc. 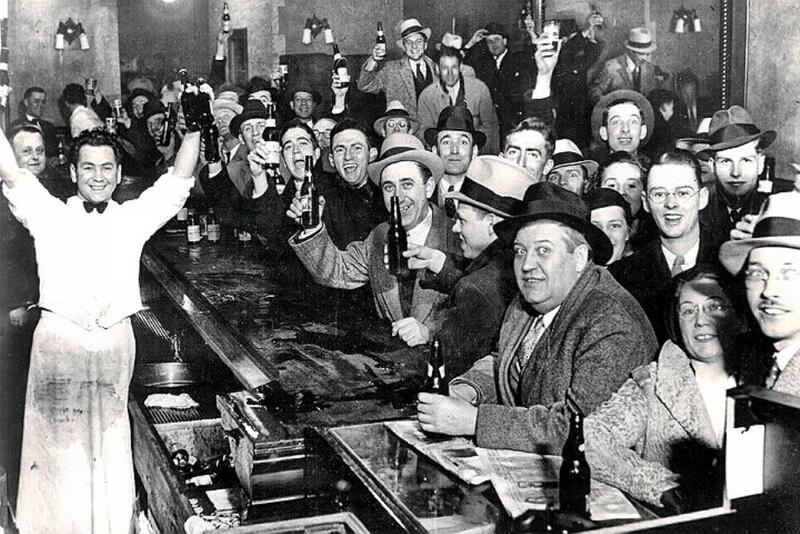 What’s the link between Rockefeller, Henry Ford and the Prohibition? Some claim that Ford’s gasoline cars beat Edisons electric cars, which kind of implied Ford had an alliance with oil companies of the time. Later Ford changed his preference to electric. Saying that charging the car with a private wind turbine would be a good idea..